Indian Society for Indic Studies (InSIS , Managed by DRPSECT, Vadodara, (Regd.) will hold its 2nd International conference in Delhi, India from 20th February until 22nd February,2018. Tentative venue will be in Delhi. 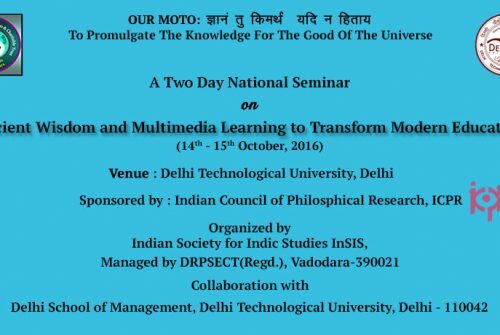 The main theme of the conference is “Applied Ancient Wisdom For Transformational Leadership”. The goal of this International conference is to bring out the applied form of ancient wisdom for cultivating a new class of creative leadership. Developing this new type of Transformational Leadership is the answer to address a range of global challenges faced by the humanity. The significance of the ancient wisdom lies in this fact that it inspires us to discuss those problems, which are remained unsolved in spite of extraordinary achievement by advancement of modern science and technology including management, leadership and governance, social, cultural, environmental and economic development.  These problems are very much related to save the integrity of humankind at the globe. There is a need of applied ancient wisdom on leadership thoughts for the betterment of the individual, society, nation and the globe as well. We find ample source materials on qualities of a good leader such as human excellence, motivation, equanimity, peaceful mind, action oriented, non-attachment, setting rules of law, impartiality, performance based knowledge, unegotistic enthusiasm, problem solving, result oriented and self awareness, self consciousness etc. Leadership is an innate human quality, which stays unblossomed in our modern society for reasons of a failed/obsolete system of formal and informal education. The absence of this natural leadership quality produces several types of ineffective leaders. The current leaders run the day to day functioning of our complex society. They lack the vision of addressing the ongoing physical, emotional and spiritual well-being needs of the society. The absence of this comprehensive and integrated view of human life from modern leadership has created many contemporary challenges of youth unemployment, economic insecurity, poverty, disease, lawlessness, terrorism, widening gap between the rich and the poor etc. These problems have further escalated the inner human disorder and have promoted conflict between different races and sections of the society. The crisis in leadership is nowhere more visible than in the global political arena. One can see the breakdown of leadership in the political discourse at local, state and national level. The elected representatives of the people forget their sworn duty of serving their constituents; instead, they get involved in petty and destructive politics. Thus, the energy of political leaders is not directed towards solving pressing human problems needing urgent attention. This slows down the progress of a nation and creates frustrations and disarray in the society. It may be argued that such a state is due to much of political leadership lacking basic understanding of the process of life and the role of a human being on the planet in the larger scheme of divine order. The chaos in political leadership gets carried over to the leadership of other societal institutions. In many organizations, different managers employ distinctly different leadership styles, ranging from relatively hands-off, facilitative styles to autocratic, micromanaging styles. The two main types of leadership discussed in management literature are Transactional leadership and Transformational leadership. A Transactional leader focuses on the role of supervision, organization, and group performance. They are concerned about the status quo and day-to-day progress toward organization goals. Human values are almost missing in this model of leadership. A Transformational Leader employs different creative strategies and techniques to boost employee performance and to accomplish internal change while maintaining respect and dignity of people involved in the organization. Transformational and Transactional leadership are extreme opposites when it comes to the underlying theories of management and motivation. In today’s corporate human resource management human values are mostly ignored giving more importance to the financial goals of the organization. While it is urgently needed to cultivate innovative leadership, new challenges of major disruptive and unstoppable forces of exponential growth in Knowledge and Digital Technology are looming over the horizon. The combined force of new holistic knowledge and a range of technologies will propel the society into the Knowledge/Conceptual Age. Some social scientists estimate that in the coming decades only 2% of the working population will work on the land, around 10% in the industry and the rest in the collaborative human networking and service jobs created by the new knowledge age of progressive ideas. All major education, political, business and other social services institutions will undergo complete transformation to adjust this fast approaching Reality. There is an urgent need to cultivate Visionary Innovative Leadership to own the responsibility of guiding the smooth transition of today’s society to the Knowledge/Conceptual Age society. It is envisioned that this development will unlock innate human wisdom and will have a profound impact in creating an enlightened society. Applied Ancient Wisdom brings practical knowledge, which helps to address the challenges faced by our contemporary society. Ancient scriptures highlight the importance of cultivating the vision of interconnectedness and interdependence of all life. Ancient practices of self-introspection assist us to purify our mind to unfold this vision. 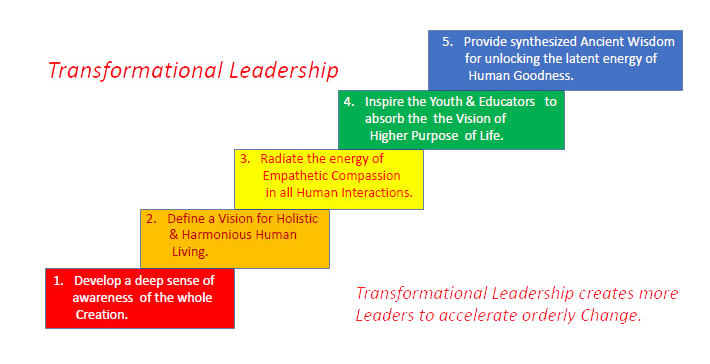 This is the process of self-transformation leading to the development of Transformational style leadership. Building a creative society is a natural consequence of that development. Ancient wisdom brings forward universal values, which are relevant for building a harmonious society. These values lie in the essence of the Vedas, Upanishads, Kautilya’s Arthasastra, Manusmriti, Gita, Ramayana, Mahabharata, and other classical Sanskrit literatures that provide proper guidance for cultivating new leadership for modern time. Thus, the main theme of the conference is to highlights the relevance of the applied form of teachings of Ancient Indian scriptures in the context of cultivating Transformational leadership. In today’s fast changing society, one can observe the ongoing disorder in the functioning of the education, social, economic and political institutions required to serve the needs of its citizens. This disorder is visible by looking at the growing terrorism, youth anger and rage because of increasing unemployment, corruptions at various levels of the society, inequitable distribution of material resources, poverty, disease etc. The leaders at various levels of societal institutions, with an incomplete understanding of the purpose of human life, continue to perpetuate disorder resulting in an inferior Quality of Daily Living Conditions for most people all around the globe. This unsustainable trend can be reversed by addressing the current crisis of consciousness in the modern leadership. Transformational Leadership, a style of leadership, can be cultivated by invoking the moral and ethical values as described in ancient scriptures. Developing this type of disruptive leadership based on applied ancient wisdom will pave the way for bringing much needed changes in the functioning of the society. The mission of this international conference is to bring together academic scholars, leading researchers, practicing professionals, spiritual leaders, and students from the fields of education, management and political science. This conference will provide a great platform for these diverse groups of thinkers to share their knowledge and original research ideas of contemporary challenges at various levels of societal institutions and offer plausible solutions. 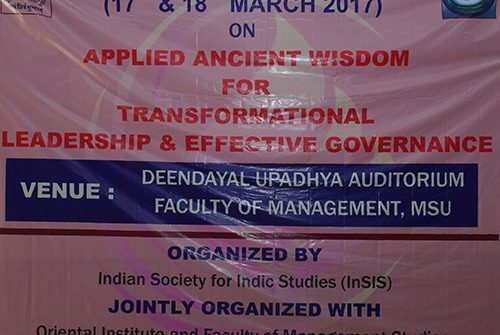 The importance of Transformational Leadership based on applied ancient wisdom will be explored by the scholars to develop practical social models and policies for the well-being of the society. This continued dialog among creative leaders is the first step to create an enlightened society. Academic scholars, leading researchers, practicing professionals, spiritual leaders and students from the fields of education, political science and management are invited to submit their original research papers with an abstract and a brief profile by the dates specified below. Selected papers will be published after a blind peer review. The conference steering committee warmly welcomes everyone connected with the field of Leadership and Education to participate in the InSIS 2018 International Conference. Enhancing Leadership Skills through teachings from Ramayana, Mahabharata, Kautilya’s Arthasastra, etc. These are suggested topics to create an interactive dialog among the conference delegates. Authors/Speakers can submit papers from these topics or variations of these sub themes based on their area of expertise. The conference provides a distinct and valuable platform to elevate the level of understanding of the issues facing the society and bring out creative and forward-looking solutions. This is an applied knowledge conference to address challenges faced by the contemporary society. Therefore, InSIS 2018 will feature two kinds of sessions: paper presentations and panel discussions. Interested scholars are welcome to submit either an abstract for paper presentation, or a proposal for panel discussion on the main conference theme or subtheme consisting three or four panelists. The original, practical and unpublished research papers are invited on any of the topics based on the theme and sub-themes of the InSIS conference. The abstract should be of around 300 words with keywords along with a short profile of the author/speaker. Full paper should not be more than 6000 words. Since this an international event, the main proceedings of the conference will be conducted in English. However some extremely valuable papers in Hindi on cultivating Transformational Leadership will be considered. Kindly note that no papers submitted after this date will be considered for inclusion in the 2018 conference execution program. This nominal fee covers the conference participation material, Food, Conference Kits. Name of the participating person. Brief background suiting participation in the event.